Over the NHL Entry Draft's 47-year history, more than 460 players have been selected by the New York Rangers. Look through the entire list, however, and you will find only one father and son combination -- Derek Stepan, the Blueshirts' 2008 second-round pick, and Brad Stepan, who was chosen by the Rangers in the fifth round of the 1985 draft -- five years and three days before Derek was born. Brad was a left winger and major-junior teammate of future Rangers legend Adam Graves with the Windsor Compuware Spitfires. He attended several Rangers training camps and spent the 1988-89 season with the team's IHL affiliate in Denver, but he never made it up to the NHL. Derek, who turns 20 years old today, is a 6-foot, 175-pound center coming off a remarkable sophomore season at the University of Wisconsin. Ranked 16th on the 2010 Hockey News Future Watch list of the top 50 drafted prospects outside the NHL, the younger Stepan (pronounced Steh-PAHN) is the highest-ranked member of the Rangers organization and appears poised to enjoy the NHL career his father pursued as a Blueshirts prospect back in the late 1980s. It’s fitting that Stepan’s birthday falls close to Father's Day, because the Brad and Derek Stepan story truly reflects the father-son bond that is celebrated each June. Growing up in Hastings, Minn., Derek knew only one coach throughout his years in youth hockey. That coach was his dad, who returned home to the Twin Cities suburbs after his brief pro career and passed his passion for hockey down to his son. Derek, a standout young player, dominated his first two years of high school hockey at Hastings High. He scored 52 points as a sophomore, earning All-State Honorable Mention and a spot on the Suburban East All-Conference team. By the time he was a junior, he needed a bigger stage, so he transferred to Shattuck-St. Mary's School in Faribault, Minn., about 35 miles south of Hastings. The school is renowned for its hockey program, having produced NHL players Sidney Crosby, Jonathan Toews and Zach Parise. In 81 career games at Wisconsin, Derek Stepan, the Rangers' second-round pick in 2008, has scored 21 goals to go along with 66 assists and plus-10 rating. The move to Shattuck gave Stepan everything he needed to further his development. As a senior in his draft year of 2007-08, he led his team in both the regular season and playoffs, posting 44 goals and 111 points in 60 games, including six goals and 13 points in a six-game run to the U.S. Youth Nationals Tier-1 18-and-Under championship. Those numbers boosted his fast-rising draft stock, and by the end of his senior year, there was no doubt Derek would be following his father's footsteps as an NHL draftee. Billed in scouting reports as an outstanding skater with the ability to accelerate quickly and pull away from defenders, Stepan knew he would be drafted, but had no idea at what point he might go. NHL Central Scouting had ranked him the 58th overall North American skater, and the Independent Scouting Service ranked him 74th overall. However, he had not cracked The Hockey News' Top 100 draft prospects list and was down at No. 167 on the Red Line Report rankings. Given all of this information, Stepan figured he would not be taken until at least the draft's third round. That left him with a decision to make -- should he and his family go to the draft at Ottawa and risk being disappointed with a potentially long wait to be selected. Stepan chose not to go. "We had decided that it wasn't really worth it to be drafted in the third or fourth round and be up there," he said. "We didn't think I was going to go even that high. So we thought it would be a safe bet to stay home and watch it on TV. Of course, now we're kind of shooting ourselves in the foot in saying we should have been up there." The Rangers scouting staff, led by Gordie Clark, the Director, Player Personnel, knew all about Stepan. Rather than risk waiting, they went ahead and took him with their Round 2 pick, No. 51 overall. All of the attention that has followed Stepan since the draft is a credit to these Blueshirts scouts, who saw this potential so early in his development. "I really didn't expect to go until the area of the third or fourth round. That's what a lot of teams were saying, so I figured I'd even slip more come draft day," Stepan said. "When I got the call, it was a really exciting thing and it surprised me, but I was also pretty pumped." Being drafted by the Rangers was particularly exciting, since the Stepan family instantly recognized the connection to his father. "It's a special feeling," said Stepan. "On draft day when he (Brad) found out that I had just been drafted, it made him really proud. When he found out it was the New York Rangers, he kind of had a special feeling for it. So it's definitely something really cool and really special." Long before the draft, Stepan had a much more important decision to make involving his next step. He had already opted not to follow his father's trail into major-junior hockey and instead pursue a college scholarship. The question was what school he might attend, and it was answered just as soon as he set foot on the campus of the University of Wisconsin at Madison. "It was kind of one of those things where I came out for my visit and they offered a scholarship. And I was saying 'OK, I'm going to take it. I'm not even going to shop around,'" Stepan recalled. "It felt right and it felt like the spot for me." Derek Stepan turned in a virtuoso performance with 14 points in seven games at the 2010 World Junior Championship in Saskatchewan last January, becoming the first Rangers draft pick to lead the tournament in scoring since Doug Weight in 1991. Playing under head coach Mike Eaves, Stepan flourished. He scored nine goals and had 24 assists as a freshman to finish second on the team in scoring and be named a two-time WCHA Rookie of the Week. 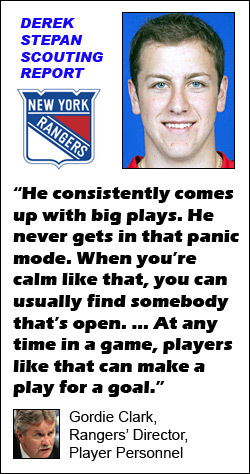 "In my first six (college) games, I was in a whirlwind and I couldn't catch up," Stepan said. "But you learn just through playing and you start to develop a sense of the game. Once you start learning it, you go from there. The style of the game is kind of a run-and-gun style where you have to physically be ready for it. In college, I have grown stronger. Obviously, I've got a lot longer to go, but you get stronger and you get at a good pace. The game's at a good pace, so you learn to be quick with the puck and decisive." Stepan elevated his value as an NHL prospect up even higher in his sophomore year, which saw him lead the Badgers with 42 assists and 54 points in 41 games, captain the U.S. to the World Junior Championship gold medal, and become the first Rangers draftee to win a World Junior scoring title since another second round pick who Stepan has been likened to - Doug Weight in 1991. Stepan was hardly a favorite to be captain of the team, but he quickly emerged as the right player for that role and was chosen by a pre-tournament vote of players and coaches. "I just kind of did what I normally do at the University of Wisconsin. I kind of was being a chatty guy and kind of a leader type," said Stepan. "When we got up to Saskatoon, coach Dean Blais pulled me in and said I got voted to be the guy. He said they were looking for me to step up and take that role. And there was no doubt in my mind that I was ready for that, and I was going to step up and be that leader for that team." The World Junior performance was nothing short of amazing. Stepan scored at least a point in all seven of Team USA's games and had at least two points in four of them. He finished with four goals and 10 assists, including a goal and two assists in the opener vs. Slovakia and a four-point night with two goals and a pair of assists against Latvia. In the gold-medal game against Canada, Stepan showed why he had the "C", assisting on a goal at 4:12 of the third period to break a 3-3 tie and then making it 5-3 with a goal of his own just over two minutes later. Canada rallied to force overtime, but Stepan and his teammates prevailed when John Carlson scored the dramatic gold-medal winning goal at 4:31 of overtime. "It was a special feeling," Stepan said of winning gold. "Especially since we were up in Canada and there were a lot of people against us. We had a real close group, and when we scored that goal it was like a big weight was lifted off our shoulders. We knew we had just done something really special." His 10 total World Junior assists were the second-most ever recorded by an American player at one tournament, trailing only Phil Kessel, and he also tied for the U.S. and tournament lead in plus-minus rating (plus-9). These remarkable efforts earned him a spot on the all-tournament team. "I never really imagined that happening, but you've just got to take things game by game," Stepan said. "I had a hot stick and I was playing well, and my linemates and I were all clicking. And it just fit. By mid-tournament, you start gaining that confidence and you just start rolling." While the World Junior stats and honors got the hockey world's attention and helped vault the previously unranked Stepan to No. 16 on the Future Watch list, the young center had some of his very best games in 2009-10 while playing for Wisconsin. 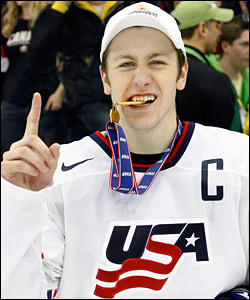 As captain of the gold-medal winning American team at the 2010 World Juniors, Derek Stepan felt a lot of pride in what Team USA was able to achieve. There were 15 multi-point nights, including four three-point games, two four-point games, and a sensational, career-high five-point game on Nov. 27 at Michigan State, when he paced his team to a 7-3 win that also earned him WCHA Player of the Week honors. The victory at Lansing, Mich., showed the very best of Stepan's ability. He had one goal and four assists, with at least one point in every period. He would do that again in the NCAA Frozen Four semifinal game at Ford Field on April 8 in Detroit, an 8-1 win over RIT. Stepan led Wisconsin to the championship game with four points on a goal in the first period, two power-play assists in the second, and another goal in the third. Unfortunately, the Badgers' magic ran out in the finale, as Wisconsin was shut out by the Boston College team that includes Rangers 2009 first-round draft pick Chris Kreider, a World Junior teammate in Saskatchewan. Wisconsin fell 5-0. "It was a fun run, that's for sure. The Frozen Four is a special tournament. We all wish that we had won it, but we came up a little bit short," said Stepan. "It was a tough pill to swallow. Our team felt so right." One of Stepan's teammates during the emotional NCAA run was defenseman Ryan McDonagh, a fellow Rangers prospect obtained in a trade with Montreal last summer. Stepan was delighted to hear about that trade and now hopes that he and McDonagh will soon play together in the NHL, too. "We're pretty good buddies. We're always playing video games together and hanging out. We always just kind of joke around about it (being NHL teammates)," said Stepan. "We joke about how we could move out there together and stuff like that. It's something that we're really good buddies and if it were to happen, we would definitely enjoy it and try to be as close as we can." It's hard to imagine many prospects being hotter than Stepan was by the end of the past season, and scouts describe him in glowing terms. Clark praises his ability to see a play develop and find the open man before anyone else on the ice realizes he is open, but also feels there is a great, untapped goal-scoring potential which could make Stepan even more dangerous as a professional. "In drafting him, we thought he certainly was a very nice play-maker, but we had also seen him score all kinds of goals," said Clark. "That’s what I think is still there. Those goals and assists numbers are going to be a little more even someday in the pros. I have seen this guy score goals any which way, and I think the pro game is going to provide more of that opportunity." McDonagh knows Stepan's game as well as anyone and agrees that his teammate might have only scratched the surface so far. "Steps is a smart player for sure, and he really sees the game in a different way from most forwards I have played with," said McDonagh. “He kind of seems to be one step ahead of whoever he's playing against, and he seems to have good chemistry with whoever he's on a line with. "He's a great passer, for sure, and he put up a ton of assists for us, but he's really developing into a scoring threat as well. A few times this year he'd let some shots go and kind of surprise the goalie with how quick his release was. It's a good sign for him that he can hopefully develop that scoring touch and continue to be the play-maker that he has grown to be and kind of be the dual threat of a player that he hopes to be." There's no doubt that Stepan wants to be the player Clark envisions with the scoring touch McDonagh describes, as he already senses the type of player he can be. "I'm going to be offensively creative. I'm going to be a hard-working guy, and I'm going to be able to take care of business in my own end as well," said Stepan. "I'm going to try to be a special-teams guy, too. One of the things that I feel very strong about is the power play. I obviously had a good year on it this year, and my penalty-killing has gotten a lot better, too. So I'm looking to develop and try to be an all-around player." Stepan is excited about his chance to follow in the NHL footsteps of former Future Watch No. 16-ranked players such as Claude Giroux, Steve Downie, Drew Stafford, Ryan Kesler and Martin Havlat. Thanks to his father, he also knows how much lies ahead in taking the next hockey step. 'He (Brad Stepan) told me about the hard work that you have to put in every single day as a pro," said Stepan. "He taught me everything he knew, and he told me all the things that you need to know to kind of put yourself in a position to have a chance to play at this level."